How Much Data Should You (or Will You) Restrict On Registration? 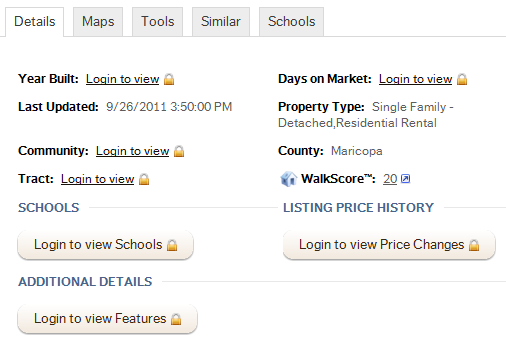 When we announced the release of dsSearchAgent v3.2 yesterday, one of the new features enabled is the ability to control lead capture by choosing which property detail fields visitors must be logged in to access. They’ll have to create an account before being able to access certain data points. Note, that this is different than customizing your registration settings by # of searches before registration and # of listing views before registration. We added a new section in your Control Panel under: dsSearchAgent Options > Click on “Registration.” You’ll see the following field: Detail Data Restrictions. How Much Data Should You (or Will You) Restrict? 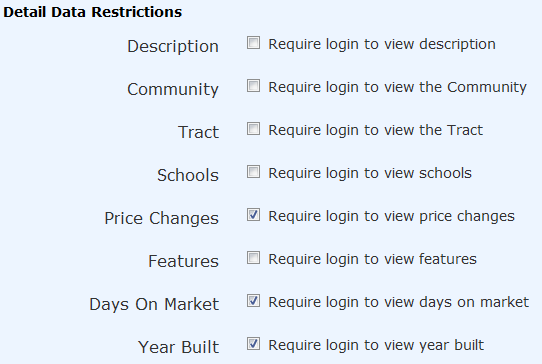 Here’s the part where I’m curious… How much data should you restrict on registration? What data do you think consumers are interested in the most? Price changes? Days on market? What data will you restrict (if at all any) to encourage visitors to register? I’d really love to hear your opinions and if you don’t mind sharing your results, we’ll do a follow up post on what others are doing and seeing success with. I’m a big believer in no registration. I think it is great that you are providing so much customization. you have to have calls to action. i think you should provide the first home information for free and then require they register on the 2nd property they view. can you modify this property? I’ve done a lot of testing on this, and what I do is allow the first 4 property views without a registration, on the 5th, they have to give me their phone number and e-mail address. I’ve tested with every number and no requirements, and this works best for me right now. I still get some bad numbers, but most are good. When I tried it with no requirements to log in, my leads stopped coming. I don’t see how that’s helpful. Of course, you still have to make the call to turn the lead into a sale. It’s best to do it immediately. Thanks for the comments on how many views before you require them to login. I have been playing with this for awhile and I am considering adding “price change” login requirements. I will give it a spin and see what happens.